Hello! 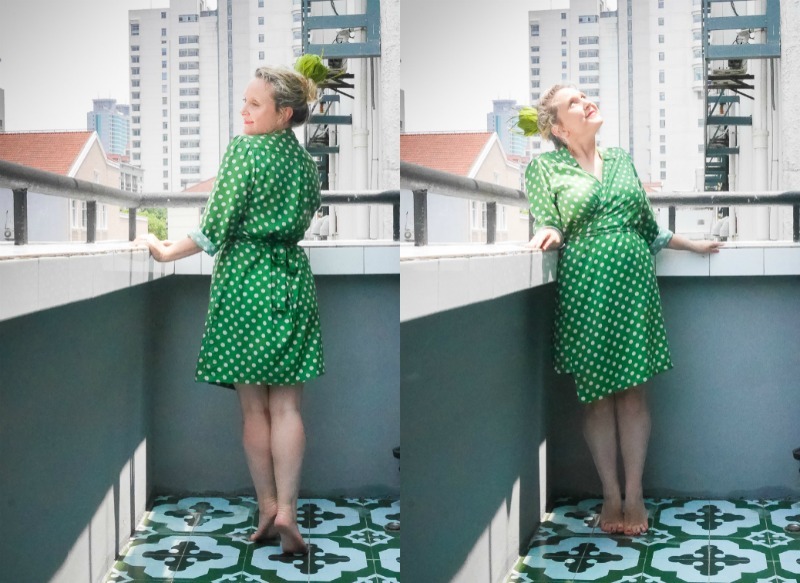 Today I have another Couture Nomad dress, sewn up over several weeks at my lovely Teacher Catherine's Couture Nomad Sewing School here in Shanghai! This is called the Pusan dress, and part of Catherine's Urban Jungle collection. She uses a business shirt style fabric for her version, and when I saw how easily she pops on her pushbike with it, I thought I've got to sew it up for Spring... well spring kind of came and went here in Shanghai, there were some nice warmer days, but it's RAINED so much. At least once a week, and today... it actually was quite cold. Humid AND cold. Not fun! So I started this to wear in Spring, and only just wore it yesterday on a lovely humid & sunny day... AND in our NEW HOUSE! I have so much to tell you about... I definitely need a pause button for our life right now! Pusan Dress was Couture Nomad's Pattern of the Month a few months back, and is a light and loose wrap dress with optional collar and different ways to tie/clasp. Catherine has a lovely light mustard one that I've seen her wear, and I wanted something green for me... and this polka-dotted light linen cotton was the first thing I spotted across the road from the Renmin Lu Haberdashery Spot... but a funny thing, half the store was a fabric shop along the left wall.... and the other side of the shop was a camouflage sport gear shop... Strange Combo, but CHINA! And so I asked how much the fabric was on the roll, and the shopkeeper didn't know... she was the camouflage shopkeeper! Not the fabric shopkeeper. So I waited a while, no one came back... more waiting... I thought I'd go buy some stationary (Yu Garden Markets have SO many things you can buy for cheaps!) and then come back to get the green fabric. So probably half an hour later, after buying my pens and envelopes, I came back ... and NO shopkeeper! Ridiculous! I waited another 15 minutes... and in the end haggled with the Camo Shopkeeper to sell me the fabric for 38RMB a metre (it's usually that at the other market for this kind of think...) and she was sooooo reluctant selling her fellow shopkeepers wares... but I couldn't stick around, I had sewing class and a three year old to pick up from kindergarten! So funny, and so China! 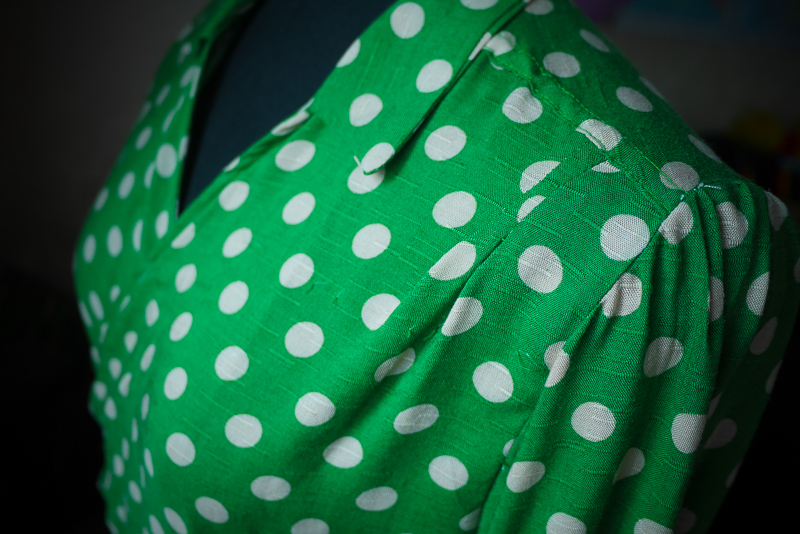 As for the pattern, it was a great trace, cut & sew over 3-4 sewing nights... love the shape with this light fabric. 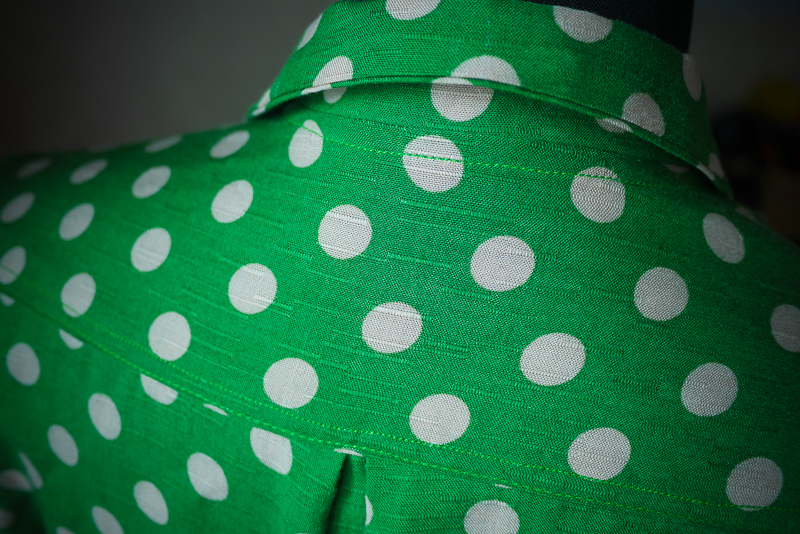 I did felled seams for the back yoke, and they came up quite nicely... I had a wrong machine bobbin problem on one side of the dress (also felled sleeves) so there's some wobbly stitching, but it's under my arm... so who will know! It's a well covered wrap dress too, in that it doesn't gape and reveal my undergarments. And the coverage around the legs is also great! I shortened the sleeves a bit, and then made the bands half the width, for I decided I would fold them up anyways... and last minute decided not to do a button/snap close and then attached the ties. It's the same material as my Bettine Dress from last year, actually... so having the ties reminds me of that. I loved wearing it yesterday! It's a great wrap dress pattern, and very quick to make! For all up my sewing hours wasn't too long, but just spread out between all the other things going on! I'll share another update soon on the busy-times here... but at least you get to see my lovely balcony, on the 5th floor of a normal building, no elevator, but in a Chinese compound. So we're stretching all our conversations, and practicing Chinese all the time now! In our old house, lots of people spoke English... but not here! We're still around downtown/Former French Concession, but more in the thick of it... brilliant green Plane Trees are all along the street and heaps of local places to check out. And walking distance to kindergarten! Thank you to Teacher Catherine for sharing her pattern & her skills with me! If you're interested in sewing in Shanghai, I highly recommend getting in touch! Send me an email and I'll connect you with Cathy! 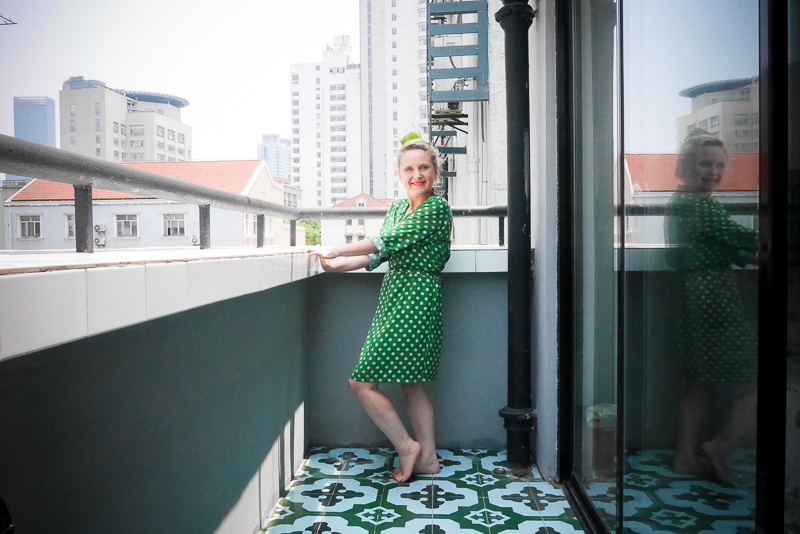 If you're in Singapore, or other parts of the world... do go and visit Couture Nomad for there's lots of e-learning spots but also there might be a Nomadette teacher in your hometown! Speak soon, and hope you're well wherever you are in the world! คาสิโน We have a service model that is attractive. Join the game. Thunderstorm Computer Networking Slot And other gambling games must be reliably at the site คาสิโน. Our only. We are the ultimate gambling establishment. The service is open. Under the instruction of a minister of justice in accordance with the provisions of Cambodia. The live broadcast of the live streaming from the best gambling to your screen directly. All our team members are satisfied. With the Thunderstruck game. Computer Networking Slot This game is very popular in this time. You may be able to join us very much with no limits. Because คาสิโน have a variety of services that are attractive. This game. The first is that you have to choose how much to bet. If you choose to bet all 9 gambling line if you choose the line. When you are going to beat it up. So be careful in choosing. Just explain to listen to still think the picture is not out. This is a really awesome to have a sewing skills and a branded sewing machine fully loaded with lot many features. You can do anything with your clothes through this sewing machine and can make lot many transformations with your dresses. You can visit my site here and can get lot many ideas. This is so adorable! Thanks for sharing. This is a really awesome to have a sewing skills and a branded sewing machine fully loaded with lot many features. You can do anything with your clothes through this sewing machine and can make lot many transformations with your dresses. You can find here about best sewing machine for home use here.